On their perilous journey, the Pilgrims, who were steeped in the lessons of the Old and New Testaments and looked to the ancient Israelites for their example, established the Mayflower Compact, which was based on Biblical standards. And when the Pilgrims finally landed at Plymouth, Massachusetts in November, they found a cold and desolate wilderness. There were no friends to greet them; no houses to shelter them; no inns where they could refresh themselves. And the sacrifice they had endured for freedom was just beginning. During the first winter, half the Pilgrims died of starvation, sickness or exposure, but when spring finally came, the Natives taught the settlers how to plant corn, fish, and skin beavers for coats. As a result, life improved. But in an attempt to prosper, they decided that everything they produced would go into a common store and that each person was entitled to one common share. All of the land they cleared and the houses they built belonged to the community and everything was distributed equally. Individual ownership was prohibited. And what was the result? Near starvation! Bradford, the governor of the colony, saw that this form of collectivism was as destructive to the people as their first winter was. As Bradford wrote in his journal, “The experience that was had in this common course and condition, tried sundry years…that the taking away of property and bringing in community into a commonwealth would make them happy and flourishing; as if they were wiser than God. For this community (so far as it was) was found to breed much confusion and discontent and retard much employment that would have been to their benefit and comfort. For the young men, that were most able and fit for labour and service, did repine that they should spend their time and strength to work for other men’s wives and children without any recompense. The strong had no more in division of victuals and clothes than he that was weak and not able to do a quarter the other could; this was thought injustice.” In today’s vernacular, this manner of life is known as “communism,” which is “an economic and social system envisioned by the nineteenth-century German scholar Karl Marx” (American Heritage Dictionary) and is defined as “a theory or system of social organization based on the holding of all property in common, actual ownership being ascribed to the community as a whole or to the state” (dictionary.com). Of course, communism didn’t work for the Pilgrims. So, as a remedy, he assigned a plot of land to each family to manage, thus turning loose the power of the marketplace. In time, they realized that the Biblical principles of personal responsibility, merit, and free-enterprise produced personal motivation which gave incentive to the most creative and industrious people to work harder than anyone else; these self-evident truths released the fundamental principle of private property so that every family could work their own land and market their own crops. 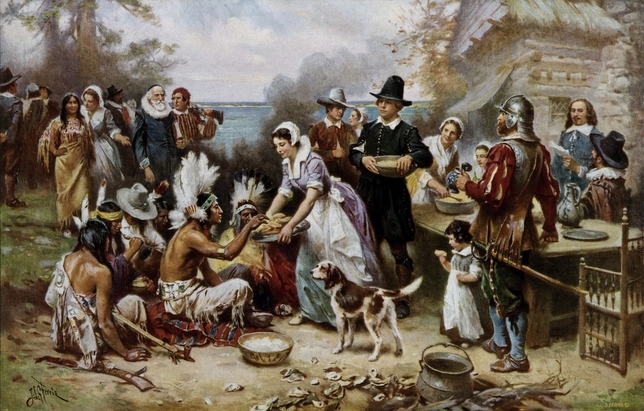 As a result, the Pilgrims gave thanks to God for the Natives who saved them that first winter and for the Lord Who gave them the wisdom needed to set up a thriving colony which, as we now know, laid the initial groundwork for the creation of our great Country.